My previous blogs will still be archived here at http://blog.rosyfinch.com, but I have had to turn off the comment feature because this ISP lacks effective defense against comment spam. It has gotten so bad that I often receive over 300 comments daily and must spend much time trying to find the legitimate comments among all the spam, much of which has objectionable content. There may be a few bumps in the road as I become familiar with the new system, so I ask readers to be patient. Please direct any comments to the new site, or contact me directly if necessary. DO NOT POST COMMENTS AT THIS SITE AS THEY WILL NOT BE MODERATED. 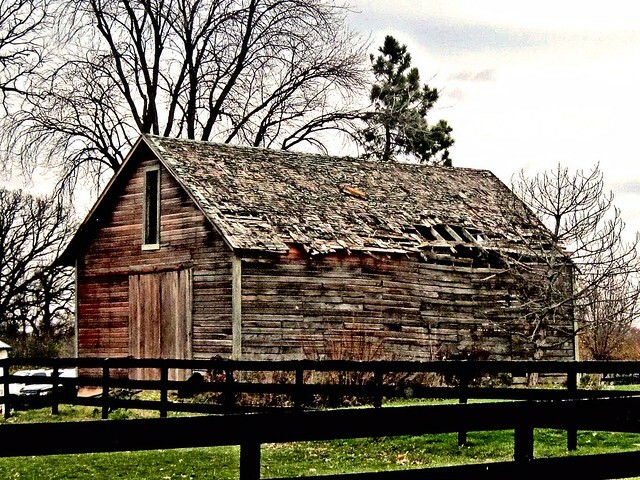 I love the texture of weathered old barns. This one is on our way to the cornfields out west of our Illinois condo. It has been an eventful two weeks since our son-in-law Roly, while deer hunting in North Carolina, fell 20 feet from a tree stand and broke bones in both of his legs. He was admitted to a rural hospital and transferred to Raleigh. After being stabilized he was transported back to Illinois and underwent surgery a few days ago (ten screws, a metal plate and a bone transplant in his right knee area, and two big pins in the other ankle). We had planned this unusually late trip up north because he celebrated a milestone birthday on Thanksgiving Day (which also happens to be the 55th anniversary of the day I proposed to Mary Lou!). Roly is now back in his home in a hospital bed in the great room, as he is unable to walk or climb the stairs. 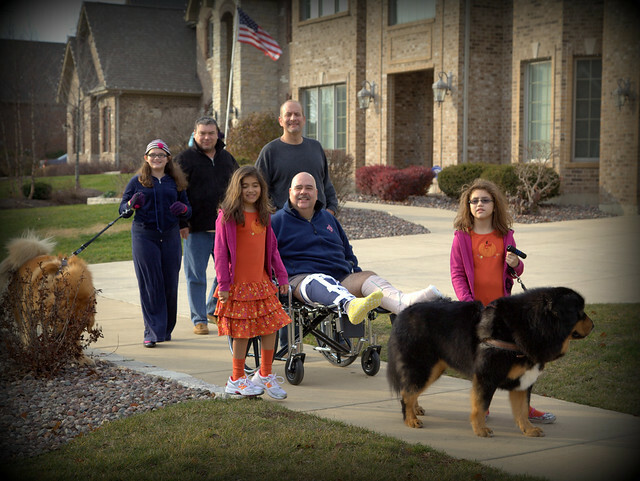 He took a “walk” outside for the first time on Thanksgiving morning, with his daughters, brother, cousins and his two Tibetan Mastiffs. The house is abuzz with relatives in from Florida and Connecticut as well as well-wishing neighbors and friends. As it turned out, it was lucky that we were here to help our daughter take care of their two daughters. His parents arrived just after the injury and will stay on to help out, so we do not feel bad leaving them for sunny Florida. We are more than ready for some mild weather! 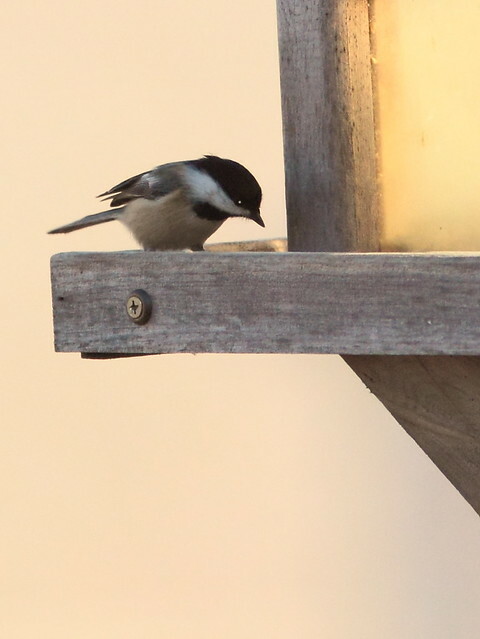 Most of our birding has been watching the feeders from the windows and back deck of their home, as Black-capped Chickadees carried sunflower seeds off, one at a time, to crack them in the trees. 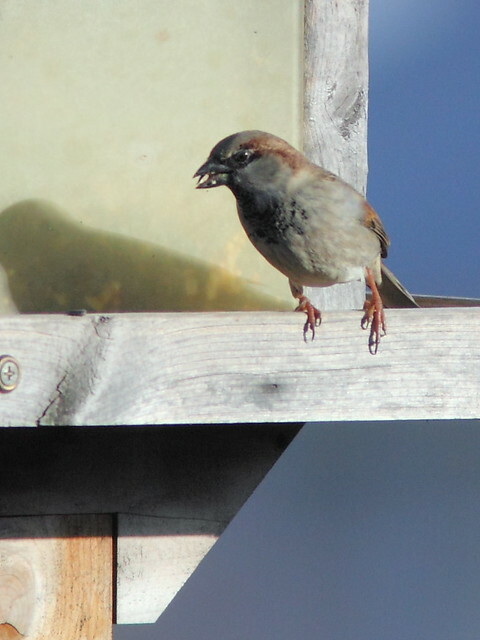 The dark “bibs” of male House Sparrows have been overgrown by gray winter fluff. 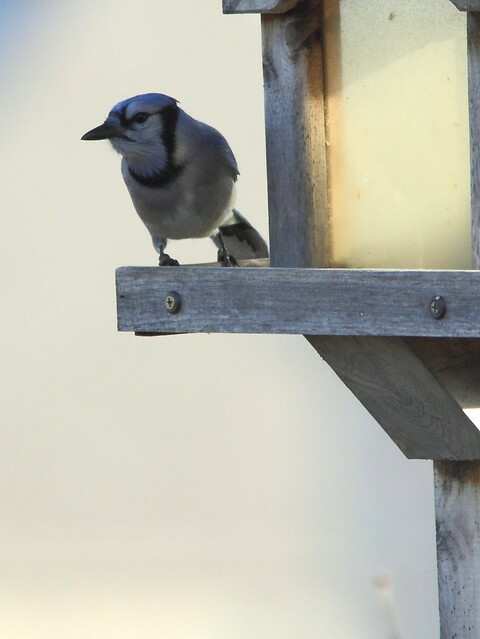 When Blue Jays arrive at the feeder, all other birds retreat. We did get out into the field several mornings. 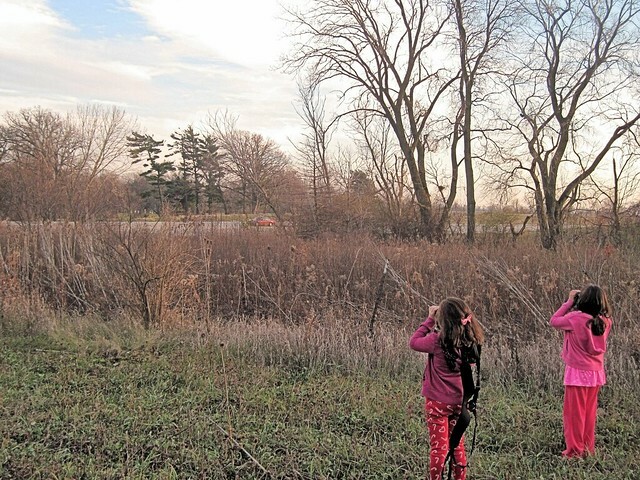 Some “outdoor” highlights of the final weeks in Illinois included taking the granddaughters to a park a few doors from their home to see the Bald Eagles that have nested there for the past couple of years. 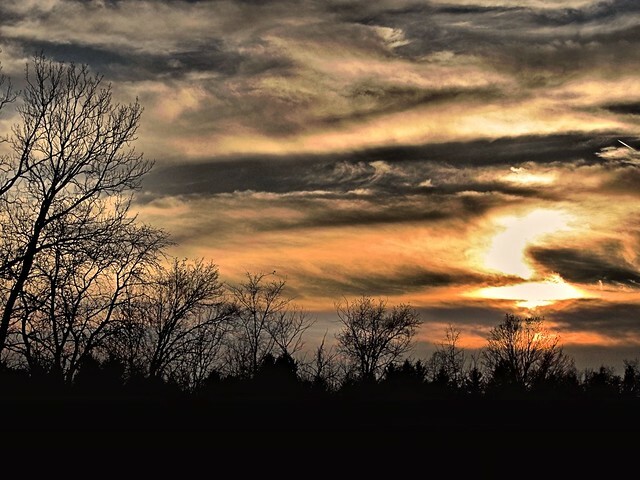 The nest tree is just across a busy thoroughfare, opposite Hawk’s Bluff Park in Batavia. The girls crept up as far as they could to get a better look at a roosting eagle. The park includes a woodland with some big old oak trees. 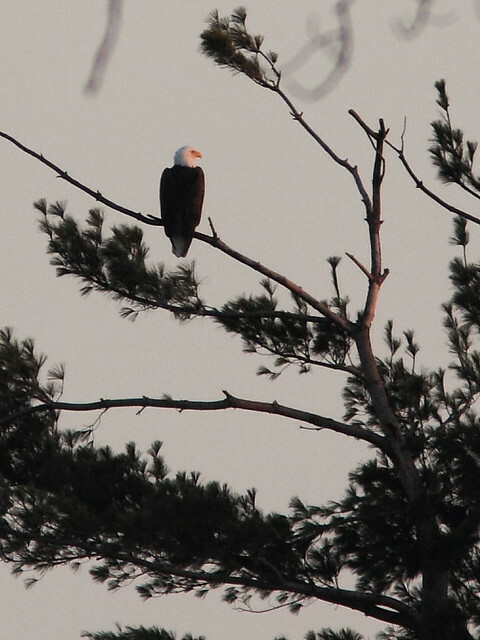 We watched the eagles until nearly sunset, when it suddenly turned very cold. 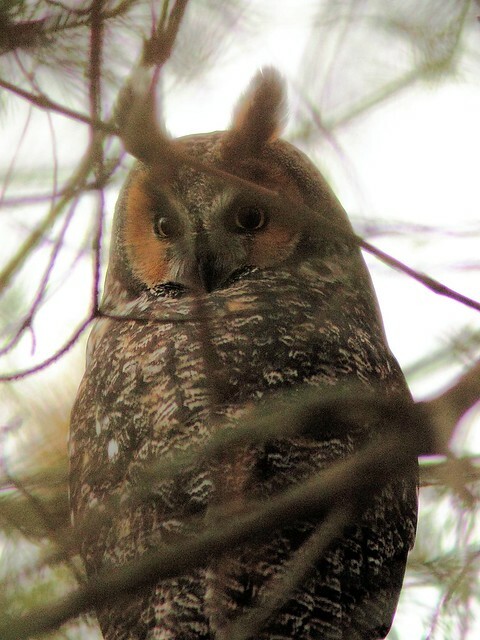 A few days before, I was with another birder when he discovered a pair of Long-eared Owls in a grove of evergreens. 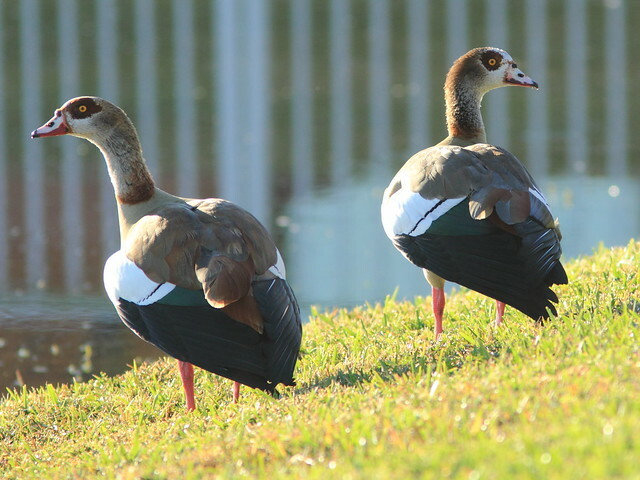 They were roosting near an old nest that included some fresh vegetation, suggesting that they may be setting up housekeeping. Like some other owl species, they may nest as early as late winter. 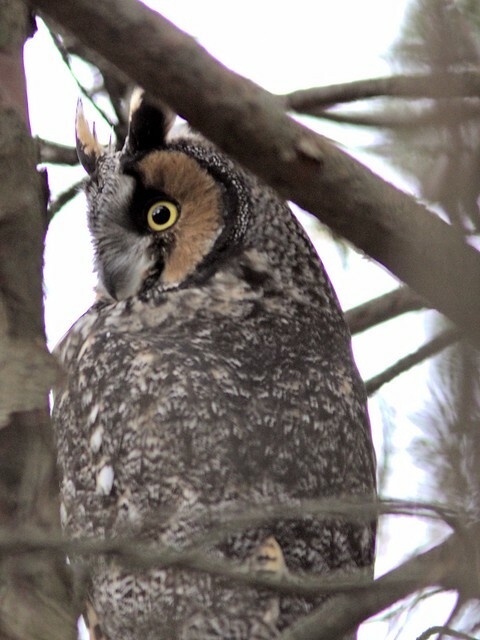 We are sworn to secrecy about the location of the owls, as they are rare enough to induce crowds of birders to enter the sensitive area of their roost. We took a few photos and quickly left them in seclusion. The camera’s automatic focus did not work because of the branches in front of the owls, and my vision is not clear enough for proper manual focusing. I was so intent on trying to focus on their eyes that I did not realize that my shots did not include the lower parts of their bodies! 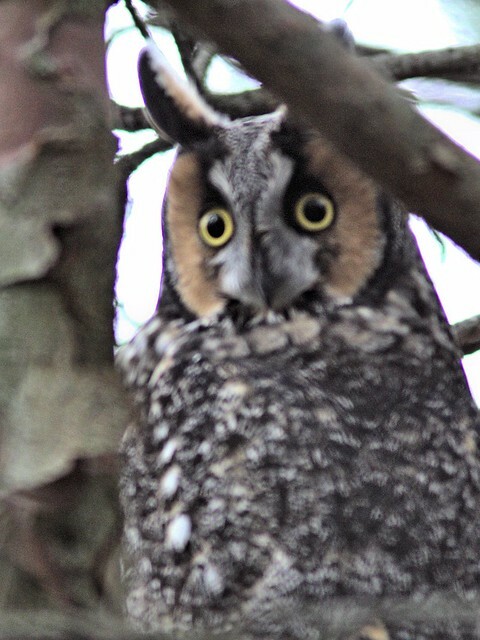 Although Mary Lou and I had seen Long-eared Owls previously, this was my first photo opportunity. 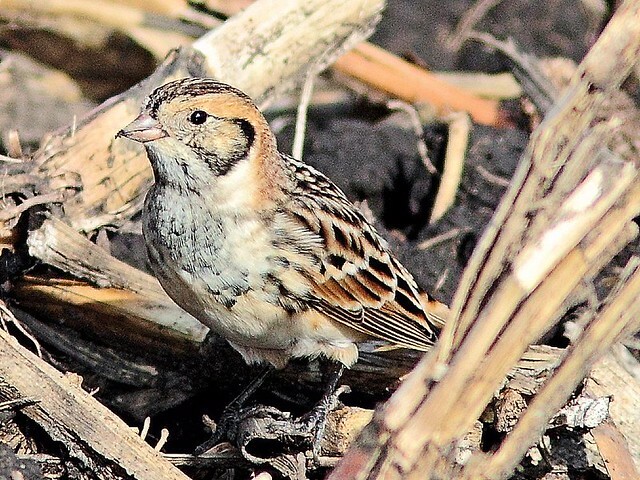 Mary Lou and I returned to the cornfields and this time got much better looks at Lapland Longspurs. We used the car as a blind and drove slowly toward the flock. 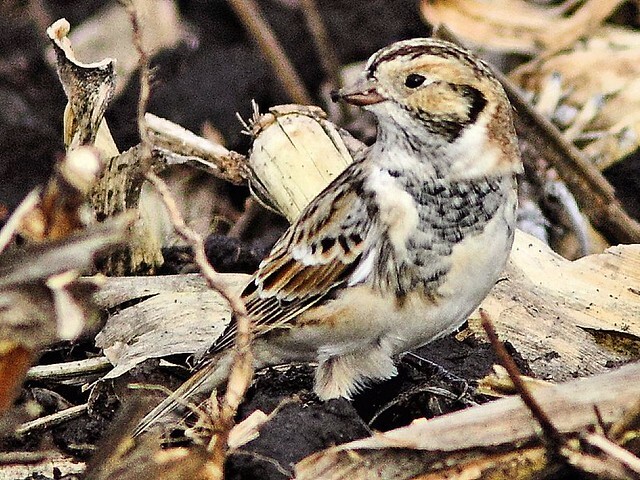 We failed to sight any Snow Buntings, though another birder photographed one at the same location a day later. 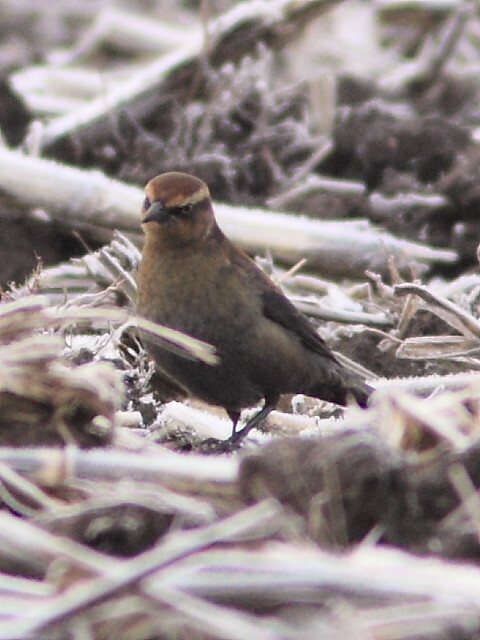 We did see a female Rusty Blackbird foraging among the corn stubble. 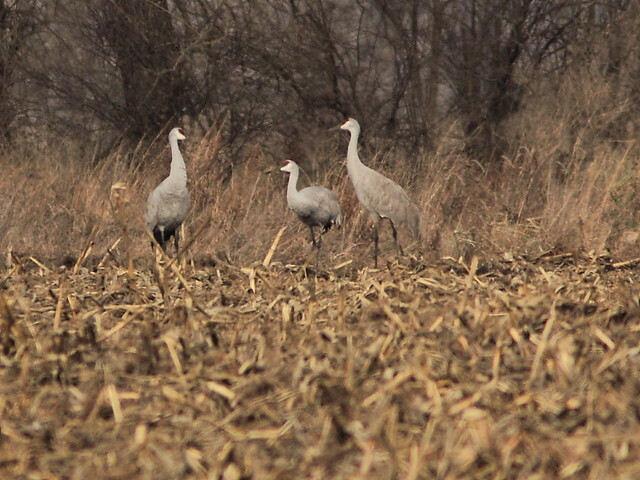 A brief walk in nearby Prairie Green Wetlands preserve in Batavia produced these three Sandhill Cranes. 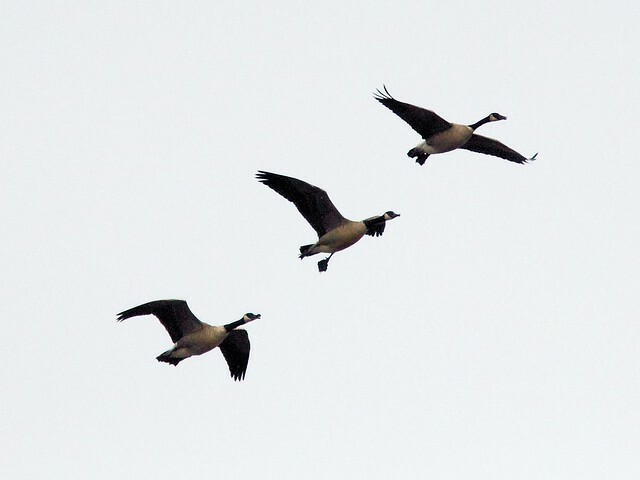 Numerous Canada Geese flew overhead. As common as they are, I find them beautiful in flight. 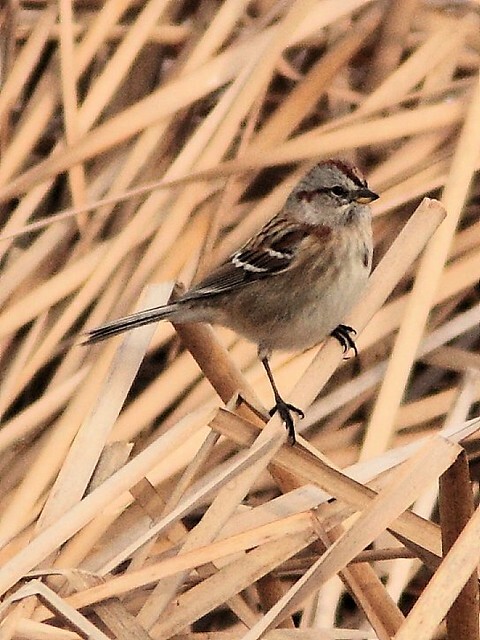 American Tree Sparrows have arrived from the north. 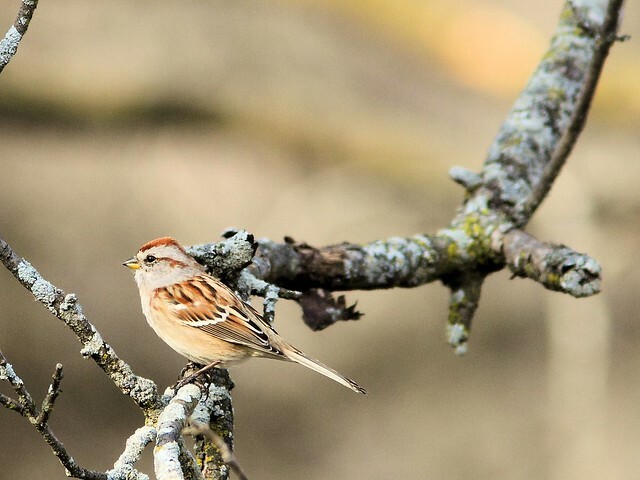 The tree sparrow has a rather bright brown line behind its eye that does not extend to the area in front of the eye, nicely shown in this photo. 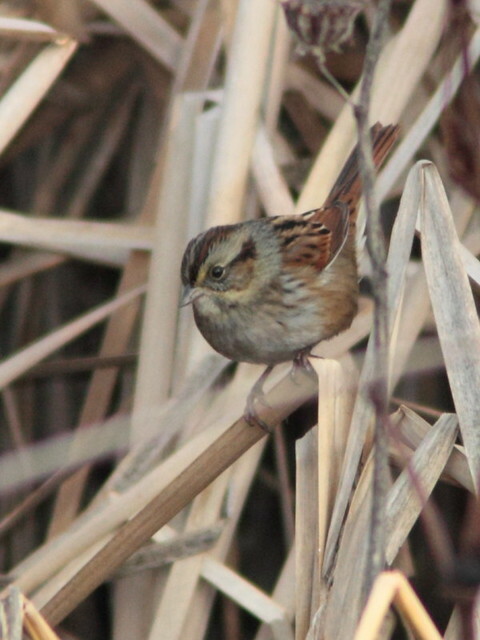 Among the flock of nearly a dozen was a single Swamp Sparrow. 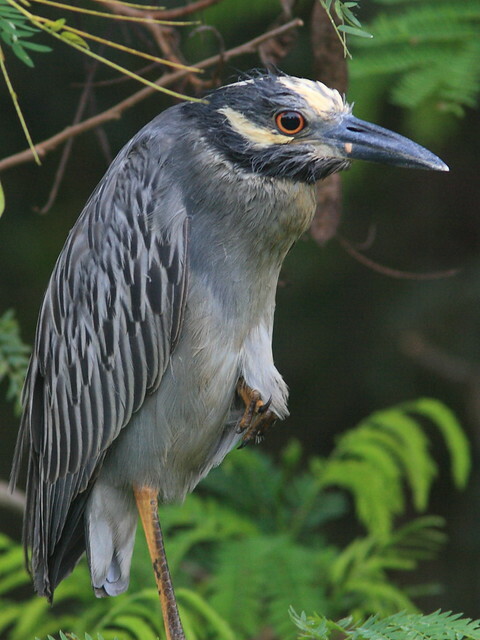 Note its pale throat, the more extensive gray area on its face and the dark “mask” created by the dark edges of its cheek patch. 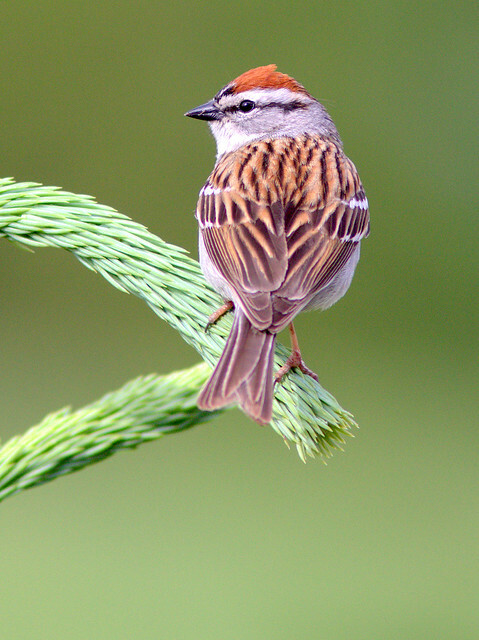 The somewhat similar Chipping Sparrow (photographed in our daughter’s back yard) has a dark line that passes through to the front of its eye. Please direct any comments to the new site, or contact me directly if necessary. DO NOT POST COMMENTS AT THIS SITE AS THEY WILL NOT BE MODERATED. We left hot and dry Illinois for hot, humid and rainy Florida a few weeks ago. Most days the weather and other obligations have kept us from getting out into the wetlands. 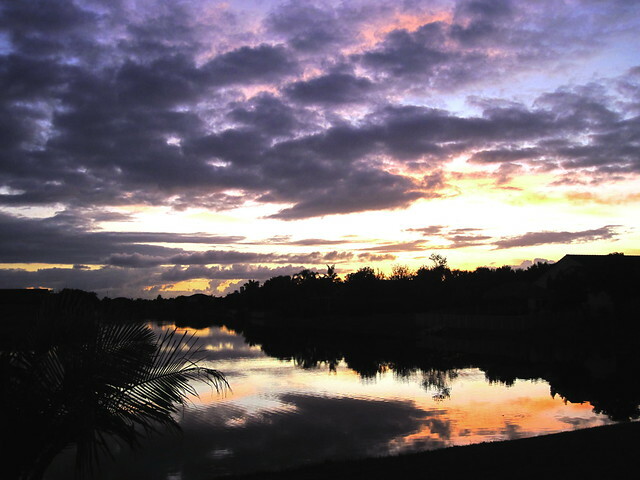 This sunrise was typical on most days, and the rain was not far behind. Happily, there were a few clear days that permitted us to take our visiting granddaughters to our clubhouse pool or to explore the wonders of our lawn and garden. 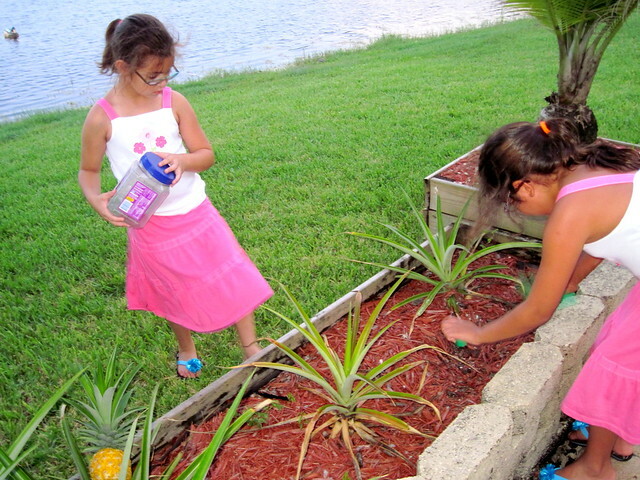 The girls had fun chasing after anoles and geckos in our back yard pineapple patch. 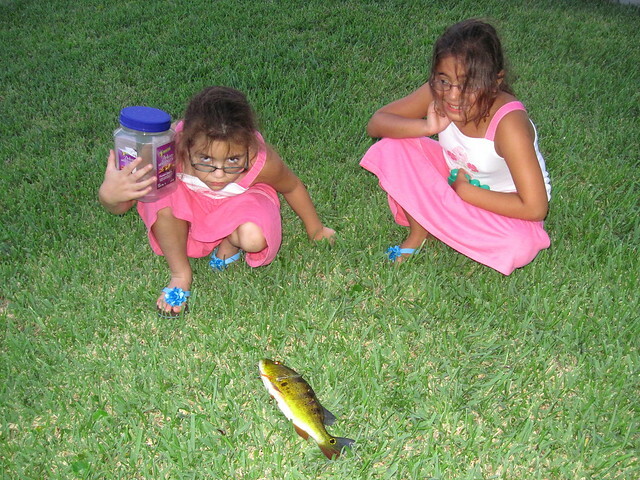 Clutching a poor captive lizard, our older granddaughter does not appreciate the irony of this situation as her eyes communicate her displeasure about the Peacock Bass that our next door neighbor just caught. He quickly obeyed her firm command and immediately returned it to the water. 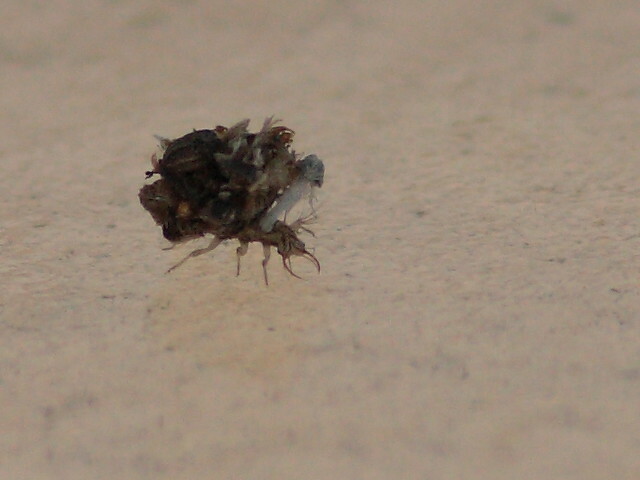 The girls found this odd creature that was carrying what looked like the bodies of a bunch of dead insects on its back. I had no idea of what it was, except that its jaws looked like those of an ant lion. My guess was close. 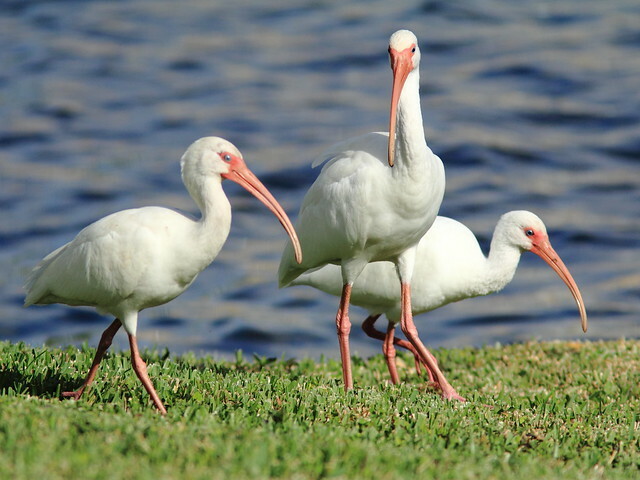 An Internet search revealed that it was the larval form of the related Green Lacewing http://www.freshfromflorida.com/pi/enpp/ento/entcirc/ent400.pdf . It collects the debris to hide it from its prey, mostly aphids, as well as from any enemies such as ants. With the girls acting as spotters, our back patio has produced a few nice finds. 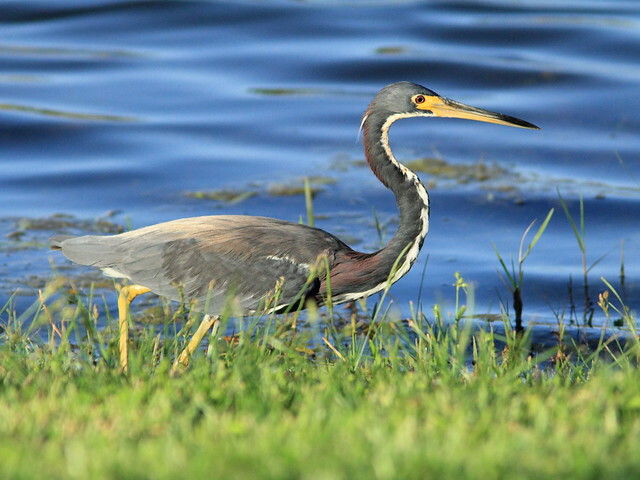 This Tricolored Heron was its usual busy self, dashing here and there in search of prey. This plunge into the lake yielded hardly an appetizer. 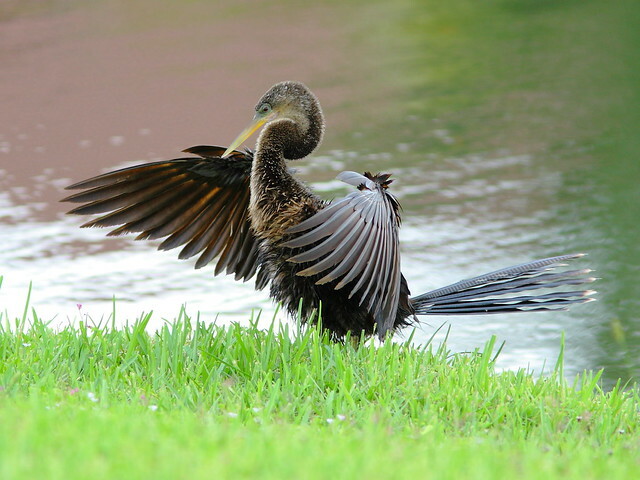 An Anhinga dried its wings next to the lake. 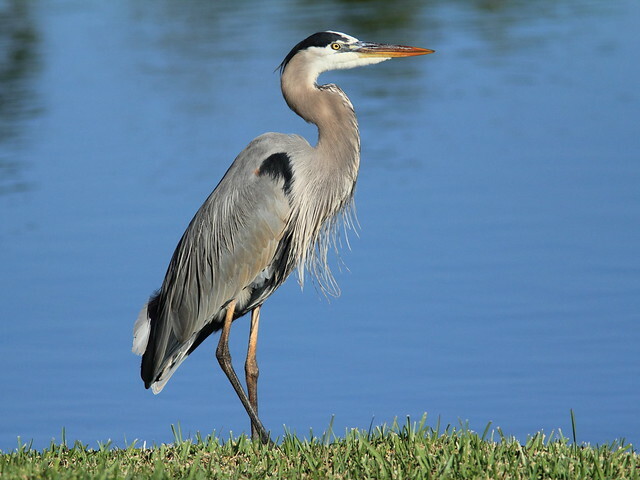 A Great Blue Heron did not fit into the viewfinder. 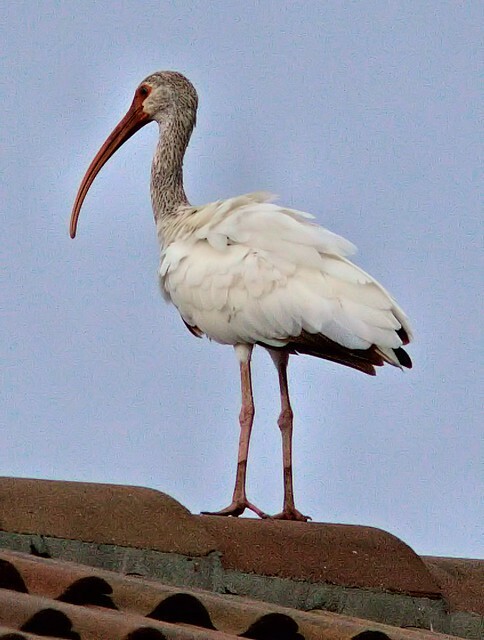 A neighbor’s rooftop hosted a White Ibis. 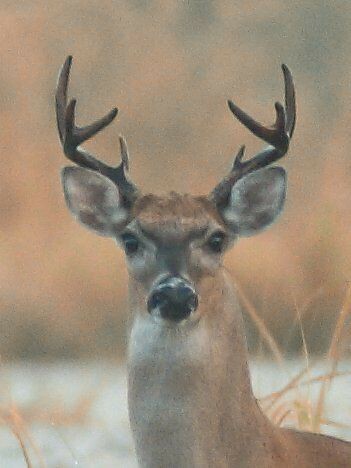 A couple of mornings we got out at sunrise, and were pleased to see a lone White-tailed deer. 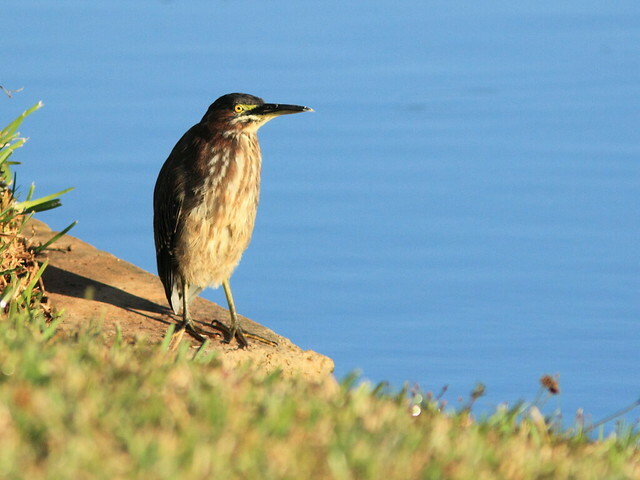 A bit smaller than those up north, they are not very numerous in the local wetlands. The young eight-point buck posed nicely. My monopod was not ready for this hand-held shot in the morning haze, so I processed it to make up for the blur. 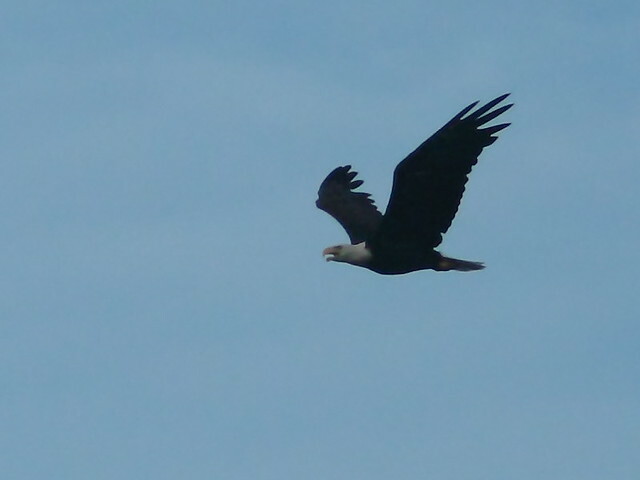 An adult Bald Eagle flew overhead from its nesting territory towards the large lake in our subdivision. 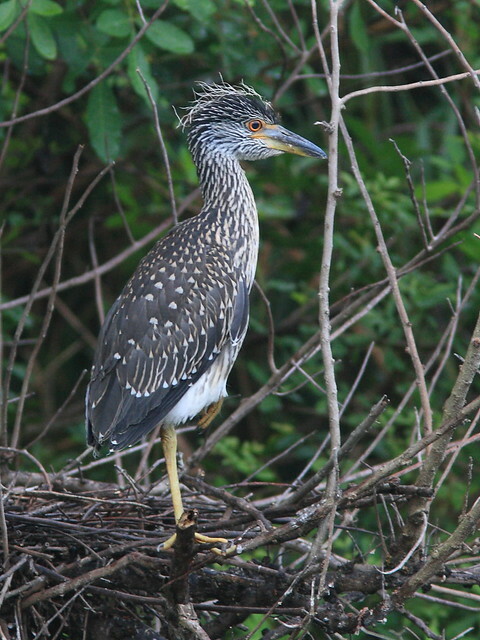 At the heron rookery, this Yellow-crowned Night-Heron chick represented the third breeding cycle of the season. 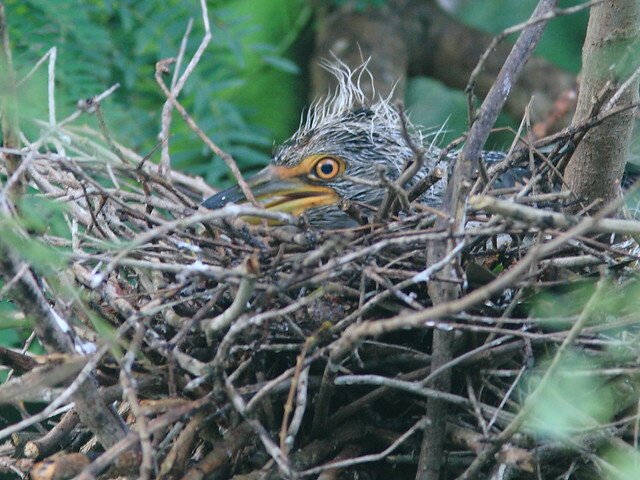 In all, over a dozen broods were successfully raised this year. 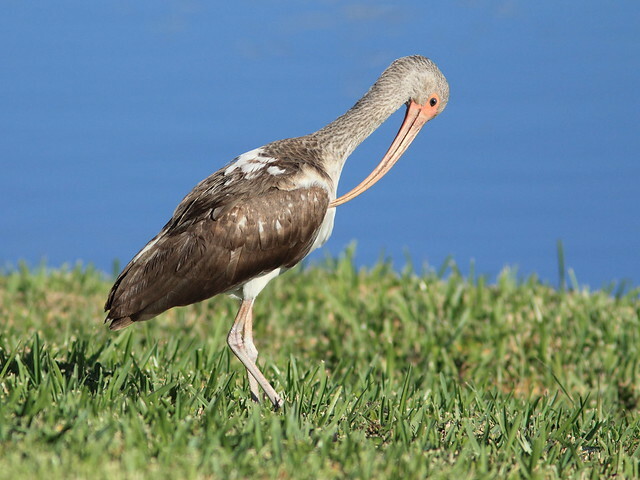 An older fledgling stood at an adjacent nest. 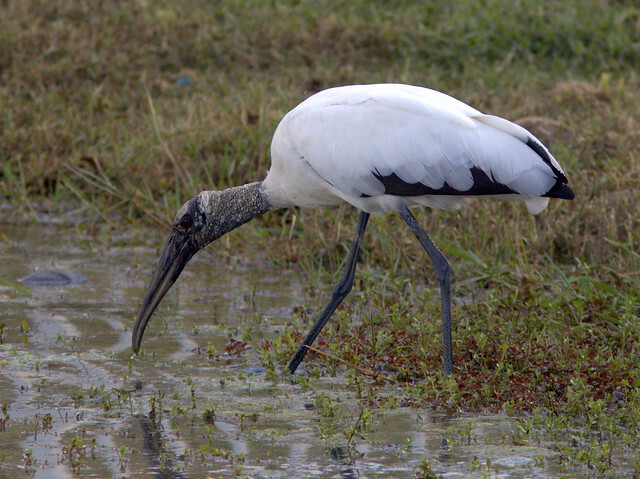 A female parent stood watch nearby. 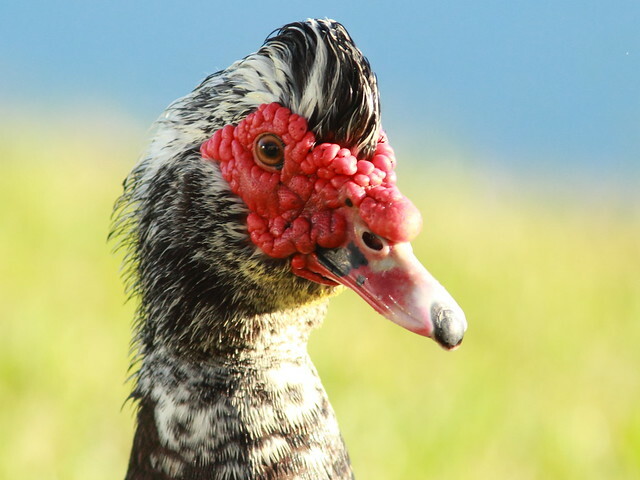 Ready for the molt, her feathers show wear and tear at the end of the nesting season. 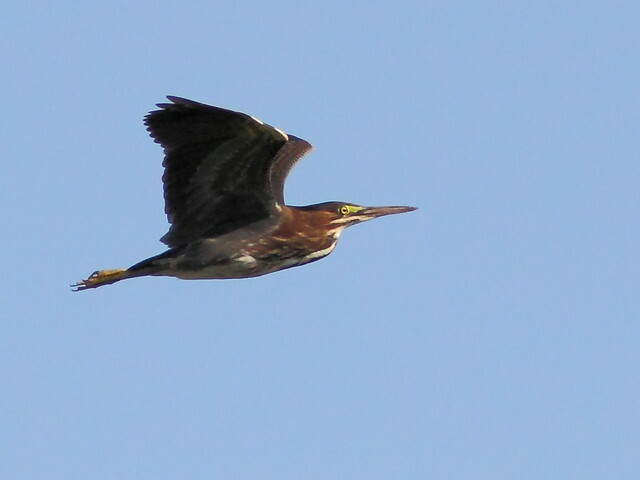 Green Herons were also quite successful, raising broods in at least four separate nests. 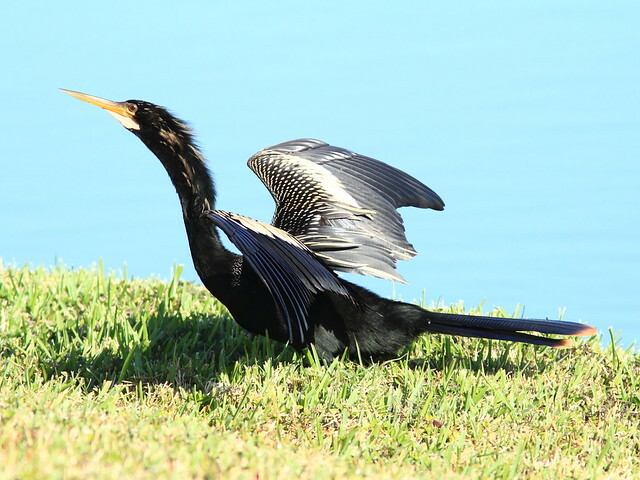 This immature bird has a streaked breast and shows a few tufts of natal down. 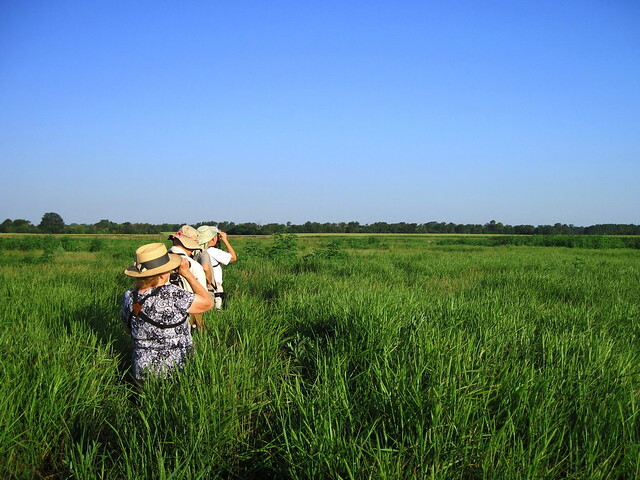 Filed under: General, Birding & Outdoors, Grandchildren, Illinois, Birding "Patches"
On June 17, a few days before we returned to Florida, Bob Andrini, President of the Kane County Audubon, led four of us on a “ramble” through Prairie Green Wetlands, a publicly-owned preserve in Geneva, Illinois (see Map). We got out very early because the temperature was expected to rise to 100 (F) by midday. 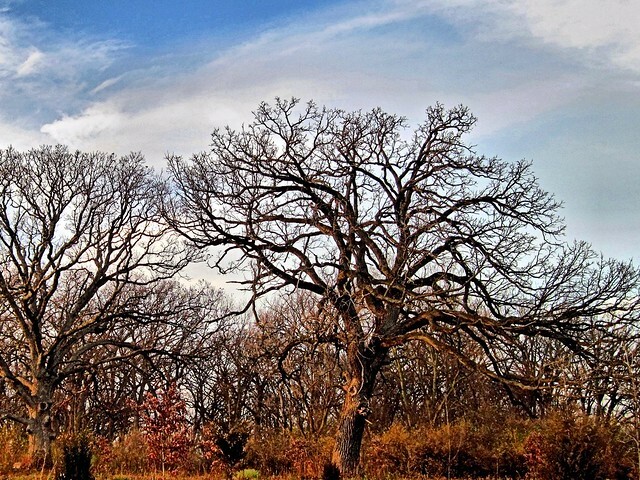 Illinois was in the throes of a record hot and dry spell. 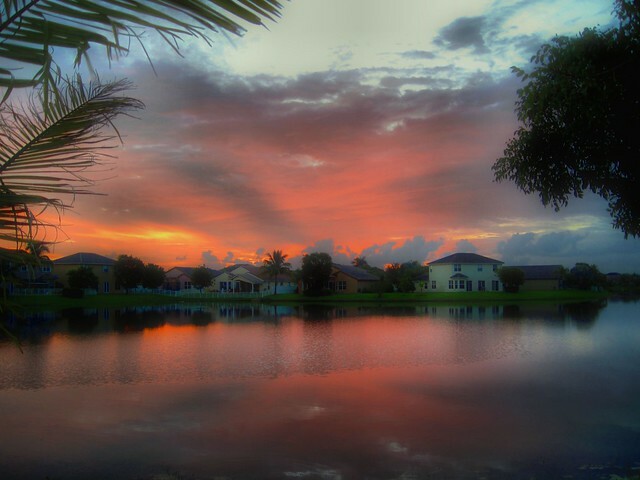 For nearly the whole month of July, it was often ten degrees hotter than back home in south Florida. The corn crop was in danger of complete failure. Tenant farmers still plant 300 of the 580 acre preserve in corn and soybean. Soybean is the crop in the foreground as we entered from the east. While soybean is somewhat drought tolerant, many of the corn stalks have not even created silk, the essential step before pollination and setting of kernels. The growth of the corn stalks is stunted and the leaves are curled because of the lack of water. 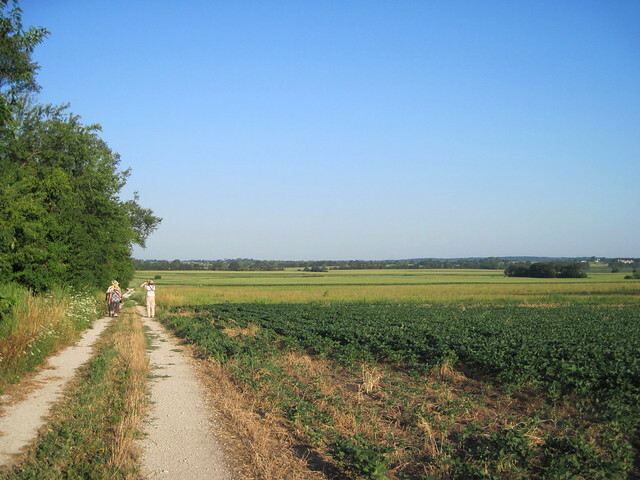 To the south (our left) is a fence line hedgerow, and beyond that part of the preserve’s 100 acres of restored tall grass prairie. 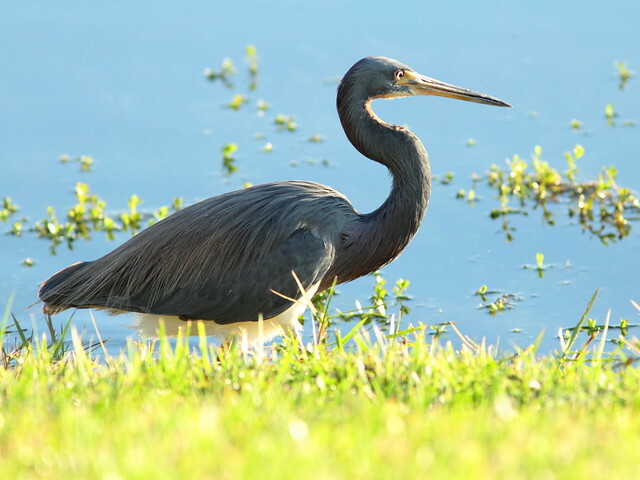 It produced several bird species, including House Finches, Song and Savannah Sparrows, and many Red-winged Blackbirds. We heard and caught fleeting glimpses of two Sedge Wrens. 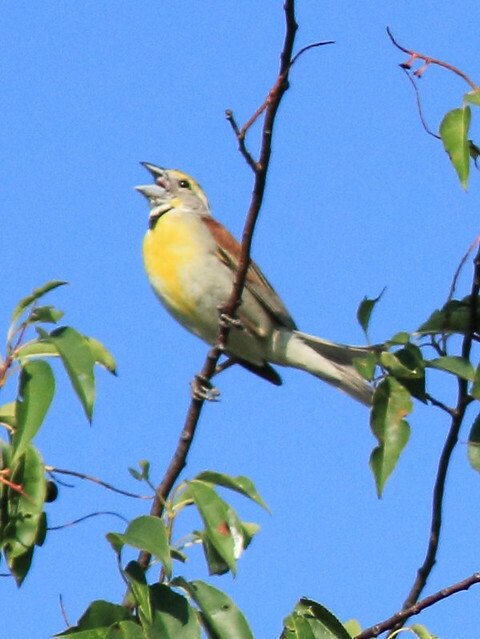 Dickcissels sang all around us. The yellow on this one’s breast was unusually clear and extensive. 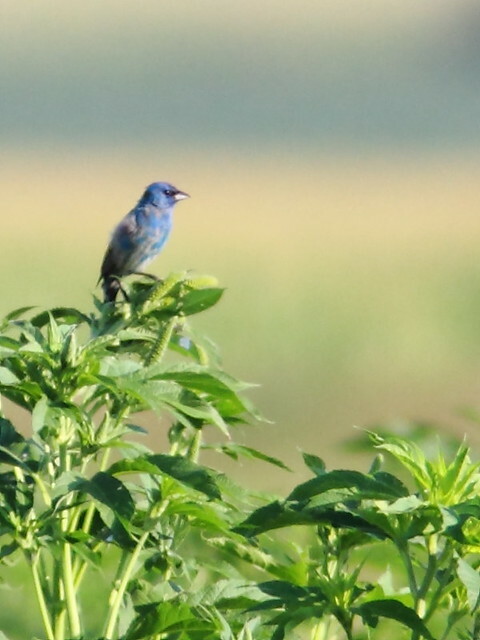 Indigo Buntings were in full song, but showed signs that they were molting into their drab fall plumage. 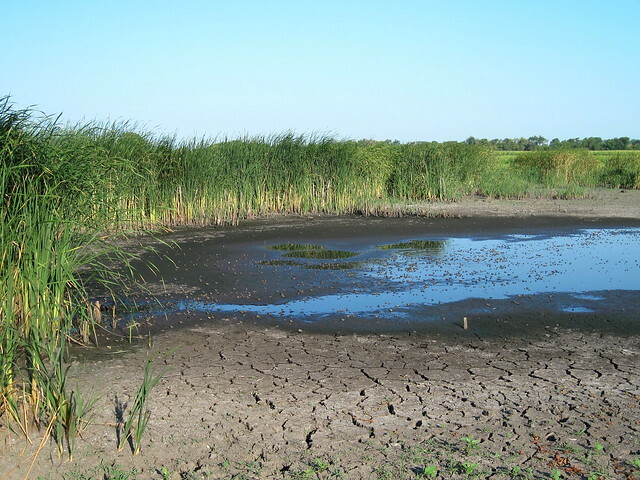 We walked westward past the crop fields into an 80 acre wetland area that is normally a moist grassland, but the soil was dry and brick-hard underfoot. 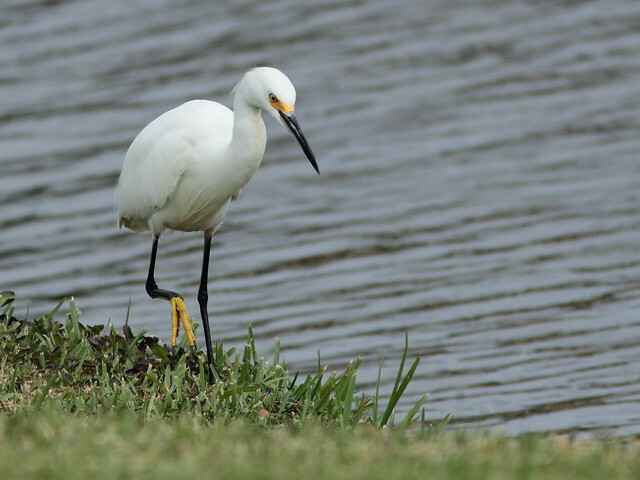 In past years a pair of Yellow-headed Blackbirds had nested in the sedges and cattails that surrounded a small lake at the far western end of the preserve. The drought has caused the lake to shrink to not much more than a puddle of water. 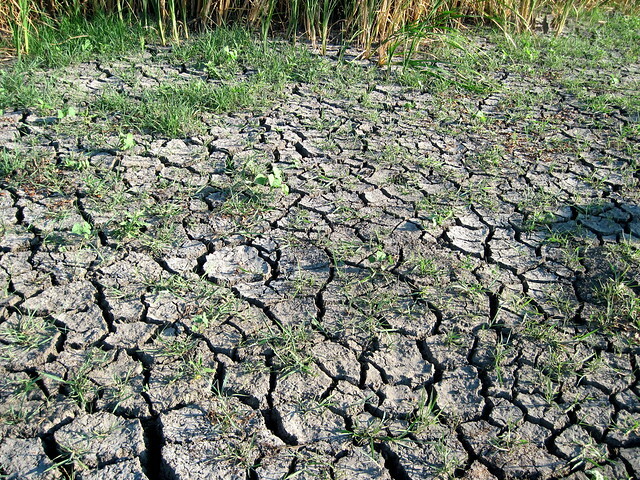 The former lake bed is shriveled and dry. The Yellow-headed Blackbirds did not return this year. 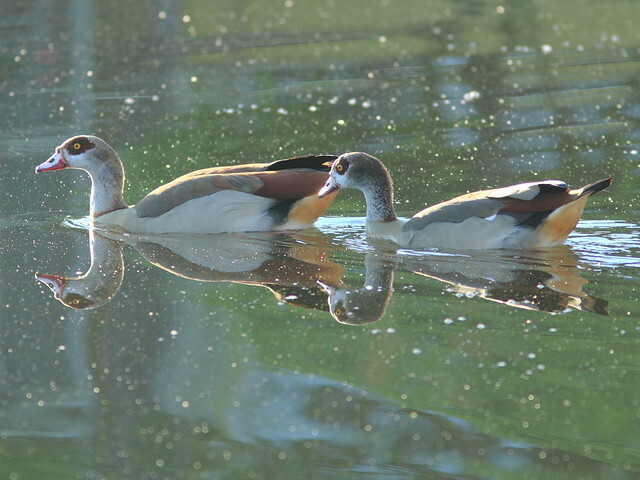 As we approached what was left of the pond, we heard the sound of water splashing and expected to see a flock of ducks fly up from the surface. 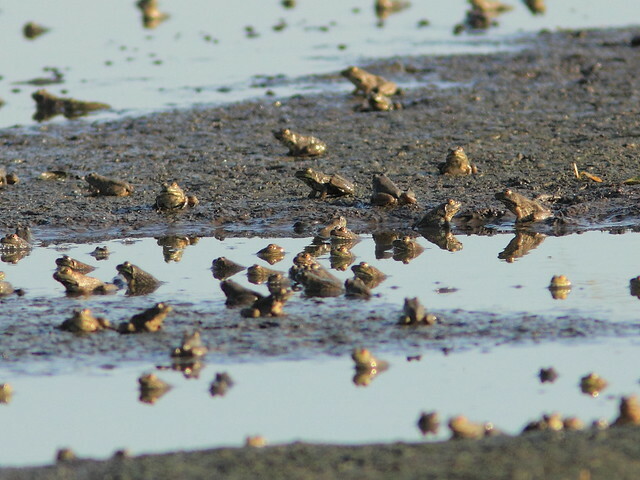 Instead, we realized that the noise came from hundreds or even thousands of small frogs attempting to escape from us. The pond looked as if it were full of rocks, until the little frogs started jumping. 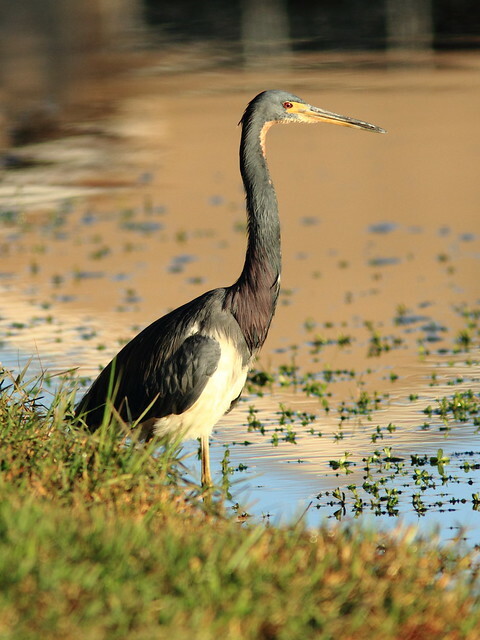 The amphibians were clearly in great danger from dehydration and were easy prey for herons and other predators. 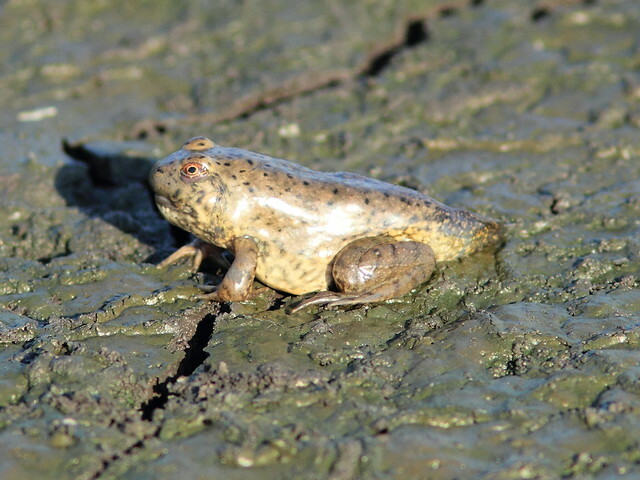 Some, like this one, had not fully emerged from the tadpole stage. 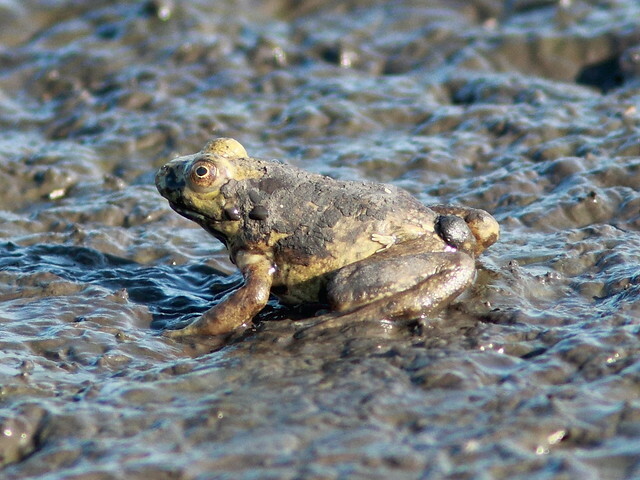 Others seemed mired in the sticky mud. Note that there is something that looks like a cluster of small white elongated ovoid objects on its abdomen near the fold of its left thigh. They resemble the cocoons of parasitic wasps such as those that lay their eggs on caterpillars such as these, depicted on a tomato hornworm. I could find no reference to such a phenomenon, so I am possibly misinterpreting the image. Click to enlarge to full size if you wish to examine the cluster more closely. Around the margins of the pond, several Semipalmated and Least Sandpipers foraged. 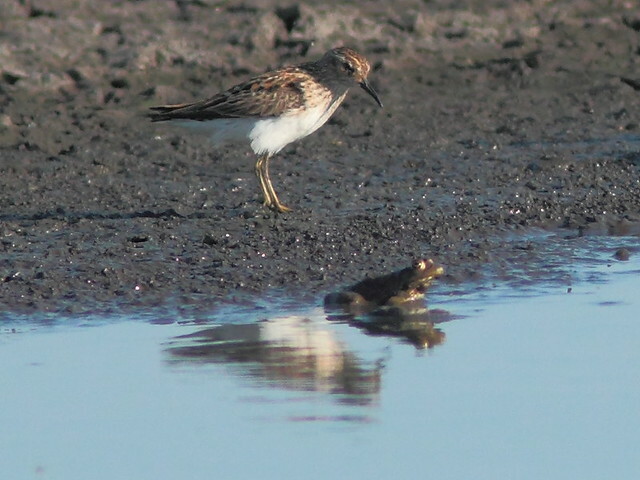 Leg color helps distinguish the two sandpiper species. 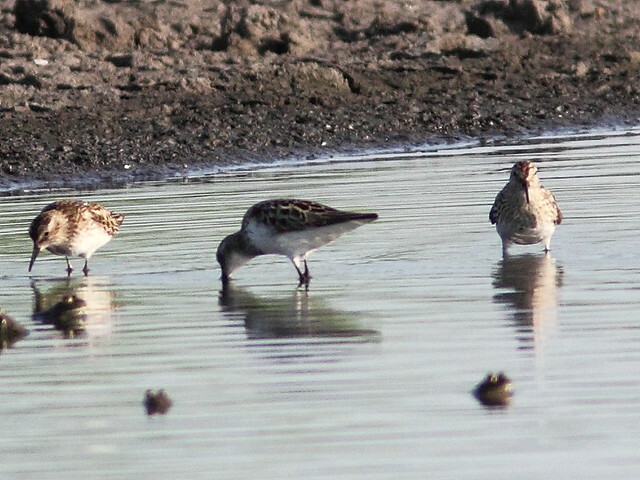 The Least Sandpiper, on the left, has yellow legs while the Semipalmated species has black (but is this actually a Least Sandpiper with muddy legs?). 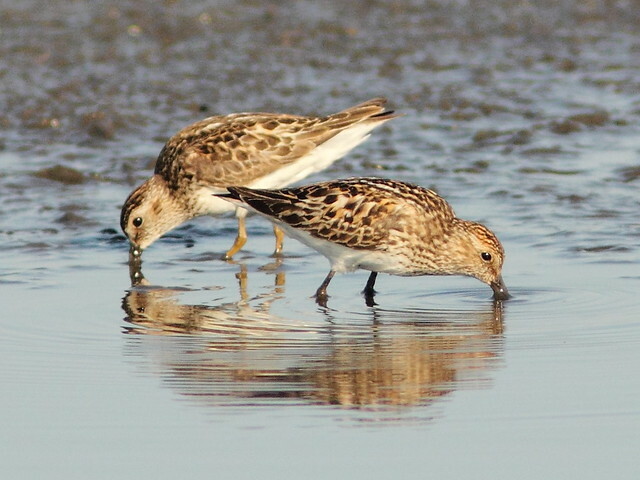 See this informative article by Cameron Cox, in which he points out that the Least Sandpiper tends to point its bill more nearly straight down while foraging as opposed to the Semipalmated Sandpiper, which extends its neck further away from its body. This photo does illustrate a difference between the two species, though it captures only an instant in time. 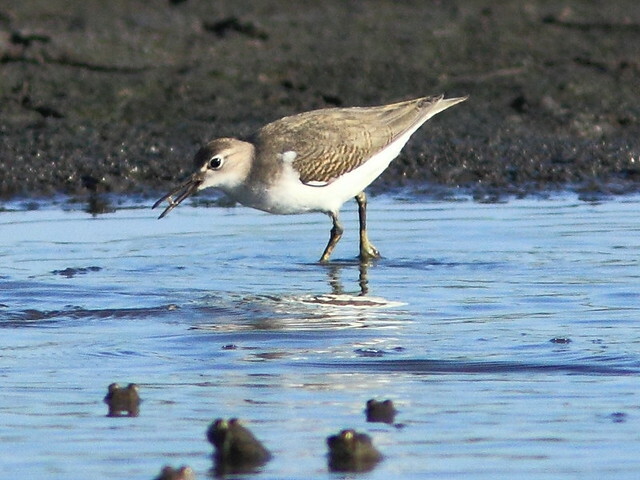 This Semipalmated Sandpiper’s grayish back contrasts with the warm brown of the Least Sandpiper. 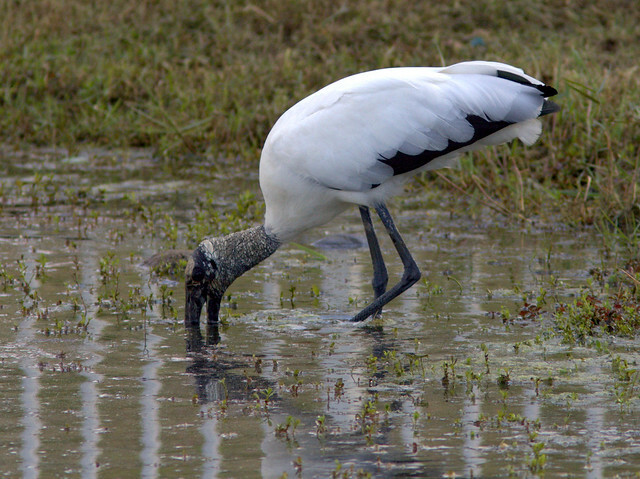 Mud on its bill makes it look fat and bulbous. 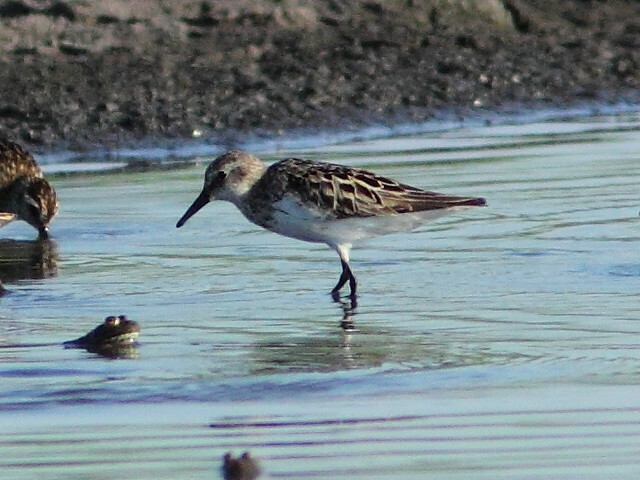 This appearance has accounted for some false reports of very rare Spoon-billed Sandpipers. 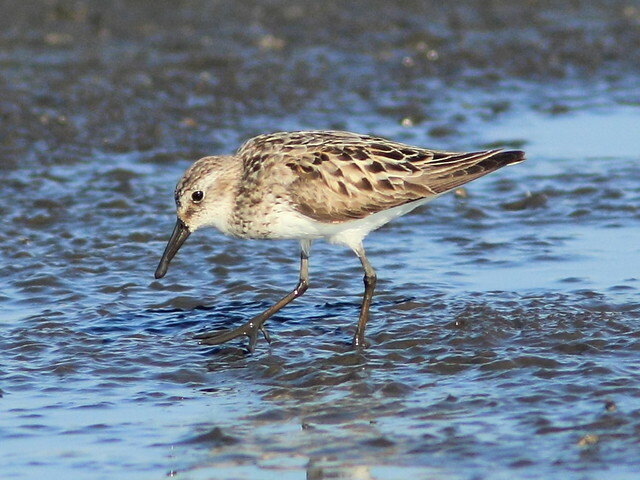 …as a Semipalmated Sandpiper walks by. Its bill, clean in this case, appears heavier and straighter than the dainty droopy one of the Least Sandpiper. One sandpiper stood out as appearing a bit larger than the Least and Semipalmated Sandpipers. It was possibly longer-winged, but the tips of the wings did not extend beyond the tail tip as would be expected in a Baird’s Sandpiper. 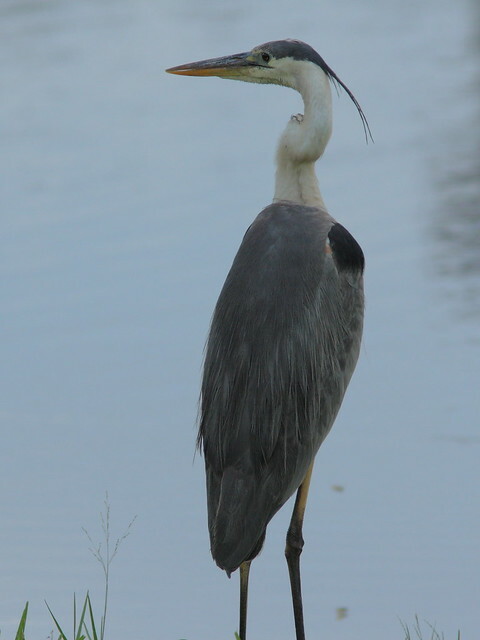 It had a rather prominent dark area on its neck and upper chest. 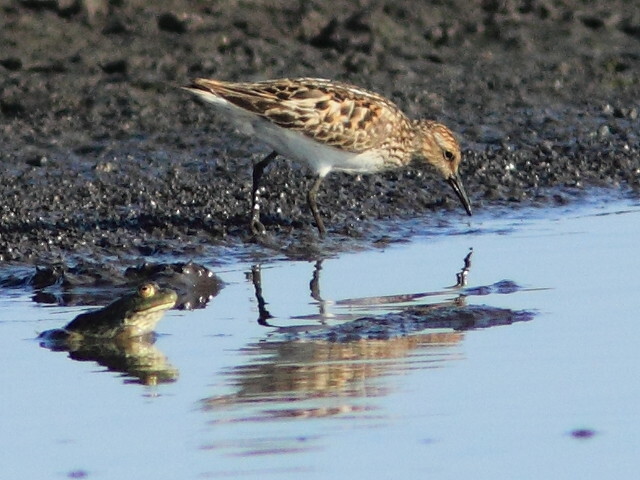 Might it be a Pectoral Sandpiper, or since it is seen between two smaller Least Sandpipers, just a larger-appearing Semipalmated? We could not concur on its identity. 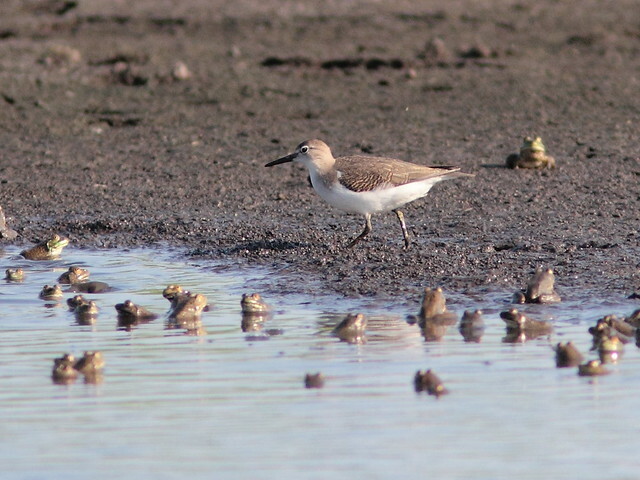 Here is a closer look at the (so far) unidentified sandpiper. The white breast of this Spotted Sandpiper extends upward in front of the wings. Barring on the wing coverts suggests that is a young bird. 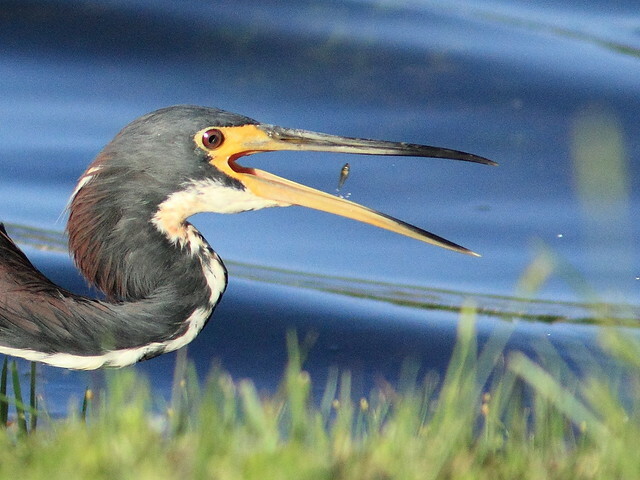 It briefly chased after a frog, but did not catch it. Here is a closer view of the Spotted Sandpiper, with a small prey item in its beak. 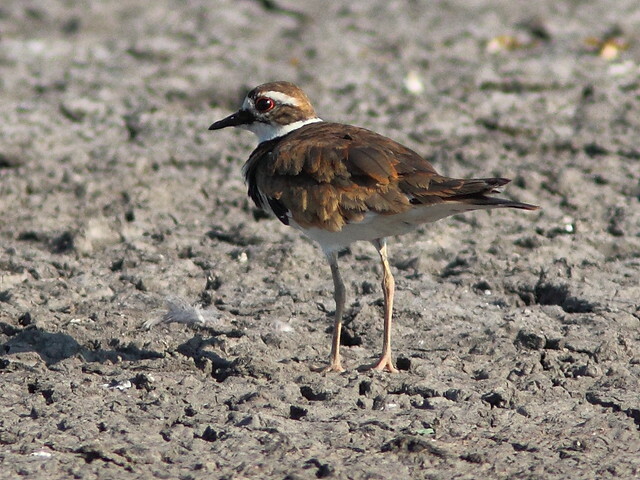 A Killdeer flew in and foraged in the dry lake bed. 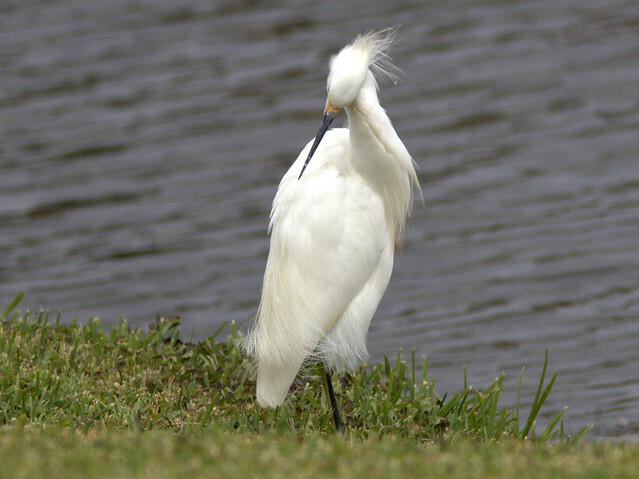 Its feathers appear worn, ready for the post-breeding molt. 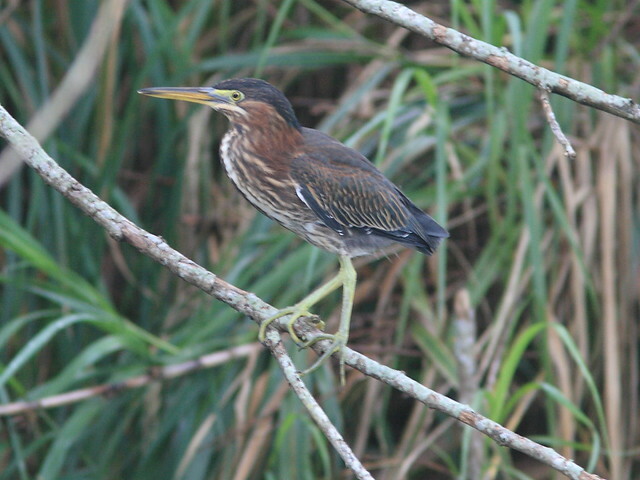 I would have expected many herons to be gathered around to feast on the frogs, but only a lone Green Heron flew up. 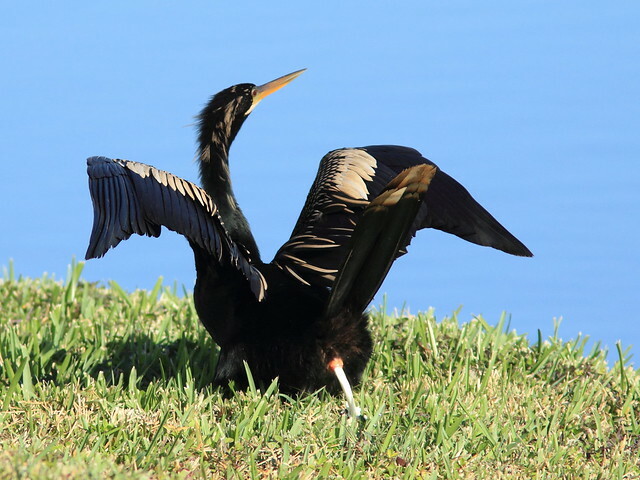 Its streaked breast indicates it is an immature bird. 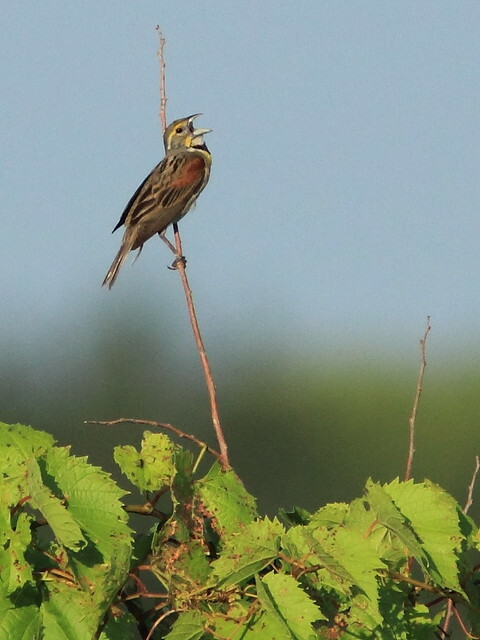 Like the Killdeer, the Dickcissel sings out its name. It’s best to approach each day in the field with expectation and a sense of wonder. 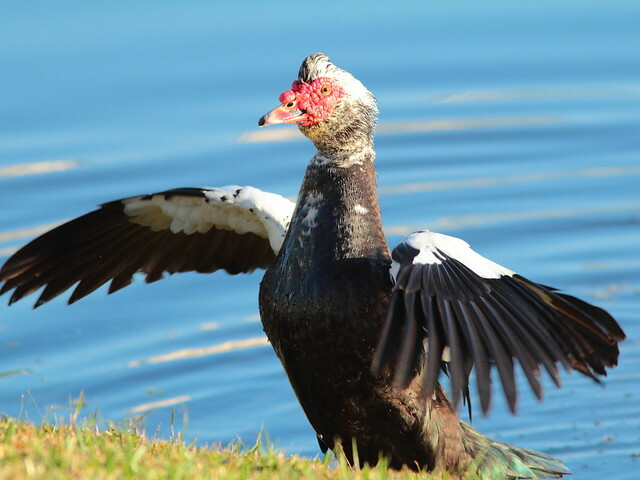 That way, even if birding is slow, you will not be disappointed, and will find beauty in the commonplace. One morning last week was no exception. Just before sunrise, the sky held the promise of a few showers, but the radar showed none headed our way. An unexpected phone call and the need to address a friend’s health concerns made us over an hour late for our walk. It was too late for me to look for the Bobcats, as they usually are only out around sunrise. In a way this was a blessing, as I have become rather obsessed with getting better photos of the adult and her two cubs, and feel compelled to get out while it is still dark, and then wait for about a half hour for them to show. In the meantime, Mary Lou usually goes on without me. More often than not I fail to see them, and I’m missing out on the “power walk” that normally precedes my photo sessions. So, this morning we got in our walk, at least the first half, before I started falling behind and exploring. 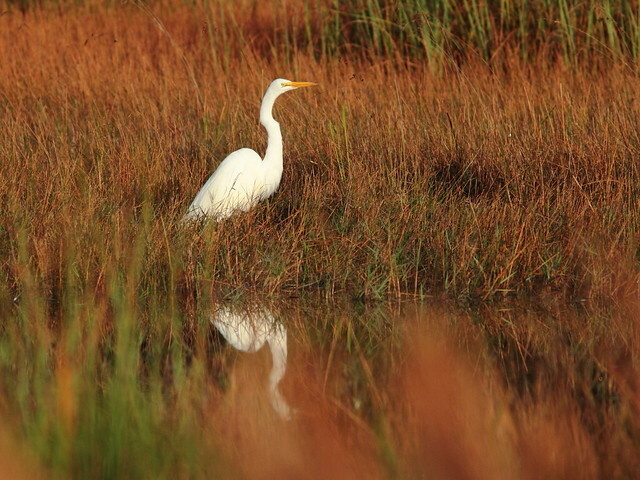 The usual Great Egret was foraging in the wet prairie next to the gravel road that accesses our local patch of wetlands. 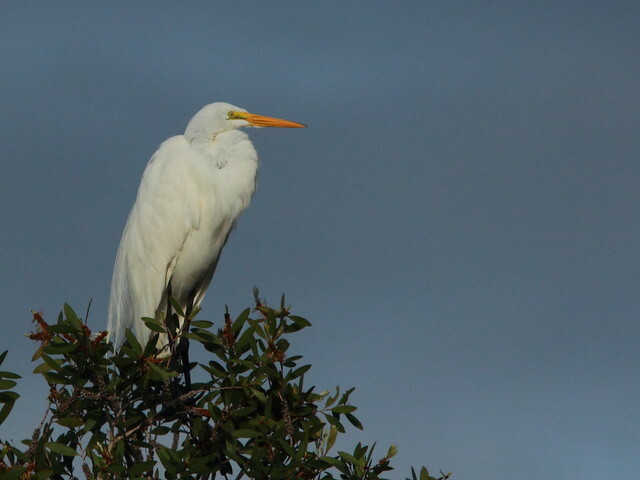 The egret flew to a treetop, probably waiting for us to continue on down the road. 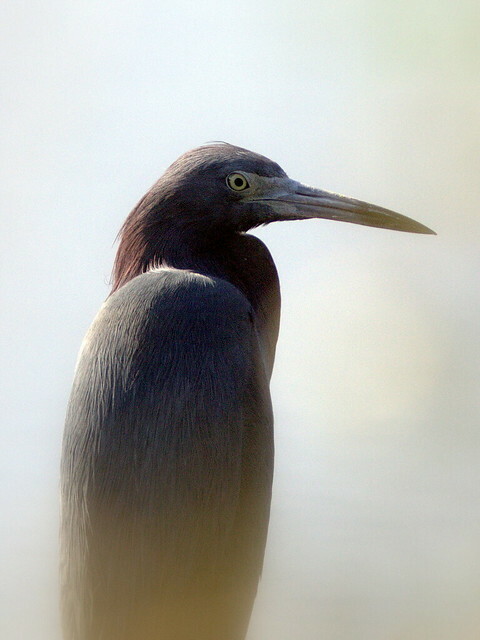 This Little Blue Heron peered out through the lakeside vegetation. I was going to trash this shot until I realized that its eyes were in good focus. Birding turned up nothing unusual. A pair of Killdeers were moving along the road in their usual run and stop, run and stop fashion. I’m hoping they plan to stay and raise a family this spring. 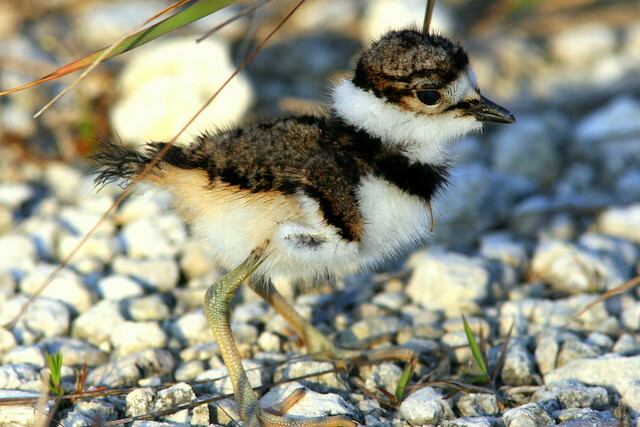 Here is one of the Killdeer chicks from a previous season. 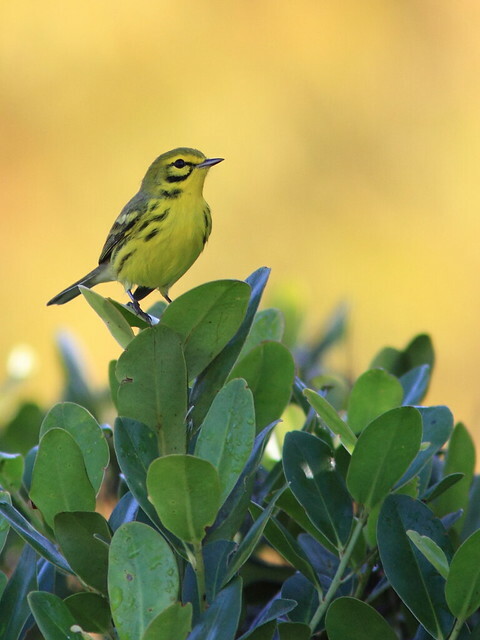 Palm Warblers, their long legs an adaptation for foraging on the ground, flew up into the roadside shrubs as we passed by. 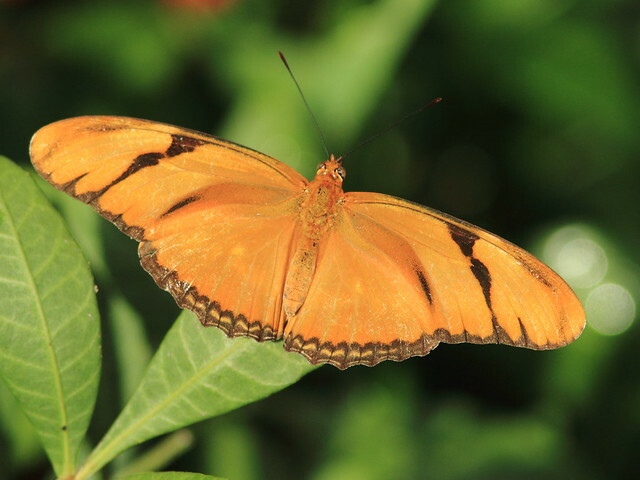 When the birds are not out and about, it is much easier to notice the butterflies and dragonflies. Julia longwings (Dryas julia) were out in large numbers. This is a fresh male. 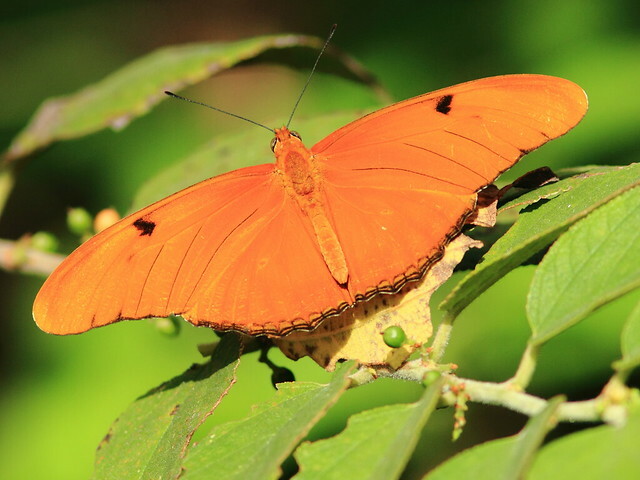 Female Julias are almost always tattered and torn, damage probably inflicted by competing males. It was a bit unusual to find a nearly perfect specimen. 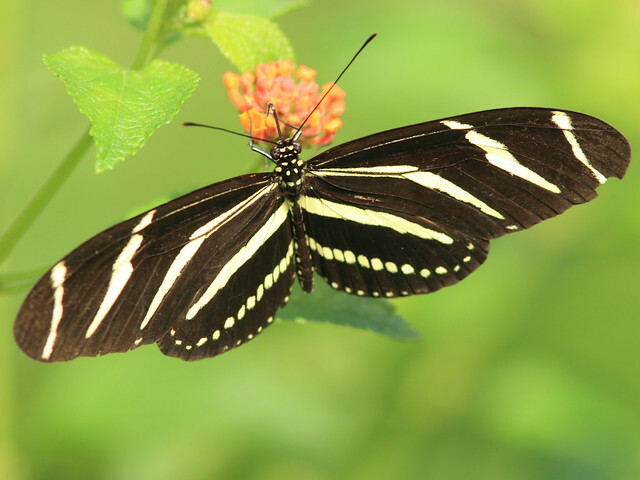 Closely related Zebra heliconians (State Butterfly of Florida with the musical scientific name of Heliconius charitonius) congregated on a Lantana in full flower. 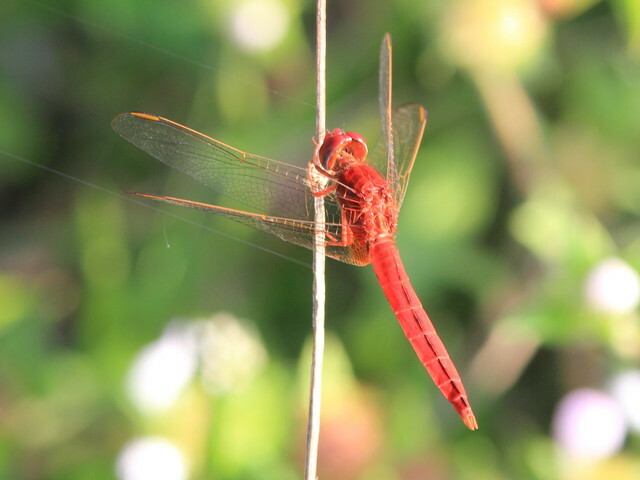 A colorful exotic Scarlet Skimmer (Crocothemis servilia) perched on a twig. An Asian native, it was accidentally introduced to Florida and Hawaii, probably on potted plants. Walking home, a large and angry-looking wasp-like insect almost flew in my face. I had never before seen such a creature. Was it new to science? It looked “armed and dangerous.” I cautiously approached it to document it for later identification. I was amazed to learn that it was not a wasp at all. 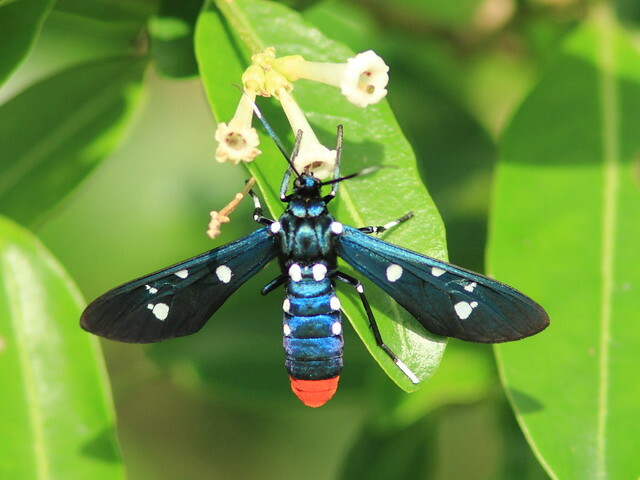 It was a Polka-Dot Wasp Moth (Syntomeida epilais). due to its diet as a caterpillar. Later, I showed this photo to Graciela, our seven year old granddaughter who had just arrived from Chicago, asking her if she thought this “wasp” could sting her. She nonchalantly said, “Oh, Grandpa, that’s not a wasp, it’s a butterfly!” I was amazed and asked her how she knew that. She said she learned it on “Wild Kratts,” a childrens’ nature show on TV. She added that it was an example of mimicry that makes a harmless insect look like a poisonous one. Elaborating on this, she said that some butterflies mimic Monarchs to look as if they are poisonous too. Rather timidly, I mentioned that this was actually a moth, not a butterfly. She looked closely at the photo and said that a moth has feathery antennae, which this one lacked! 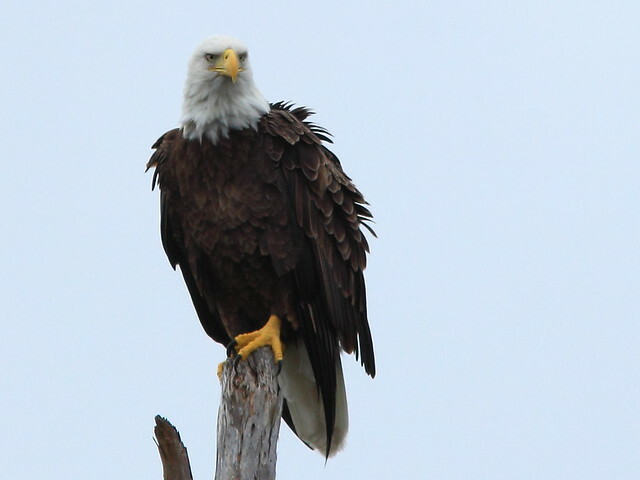 Our local eagles have set up housekeeping in the same nest that we now have been observing for five breeding seasons. We are quite certain that the first egg was laid on December 11, when the female suddenly started sitting low in the nest. 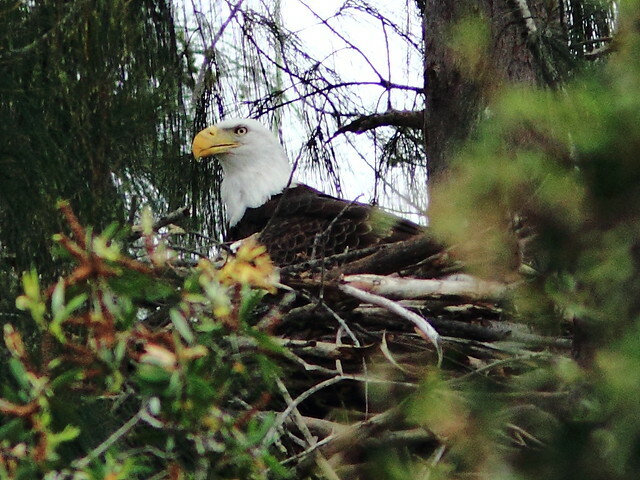 Two days before, I captured this image of her roosting near the nest. When we visited on December 16, I first thought the nest was empty, but after about 15 minutes the female stood up to change position and also probed down underneath her, probably to rearrange one or more eggs. 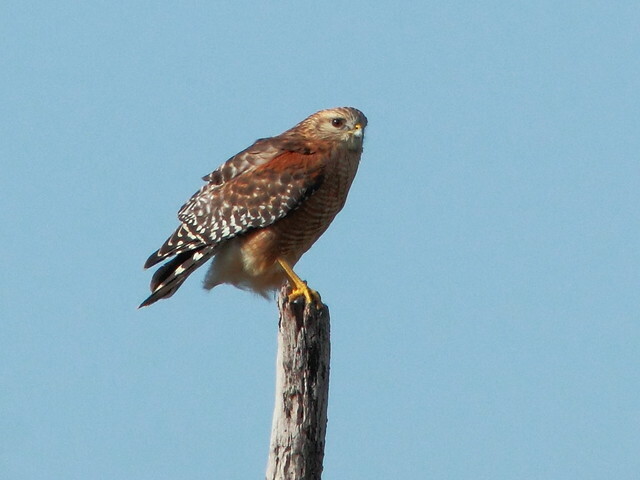 A Red-shouldered Hawk roosted near the eagle nest. At Chapel Trail, birding was also quiet. 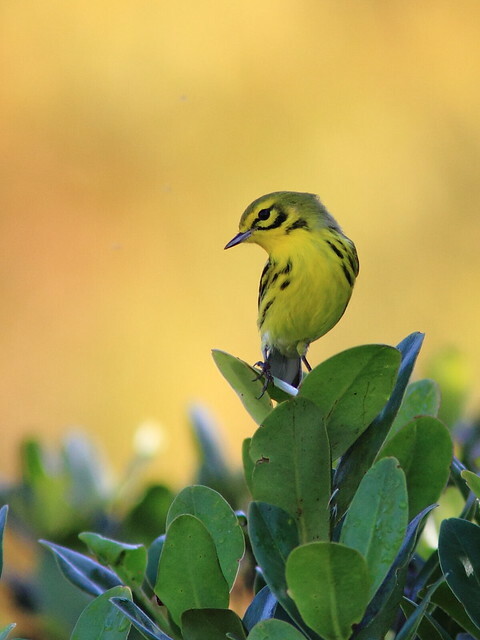 We turned up a couple of common species, but this male Prairie Warbler was uncommonly beautiful as it perched against a backdrop of Cypress trees that were just beginning too turn golden brown.